Product prices and availability are accurate as of 2019-04-07 08:00:13 UTC and are subject to change. Any price and availability information displayed on http://www.amazon.com/ at the time of purchase will apply to the purchase of this product. 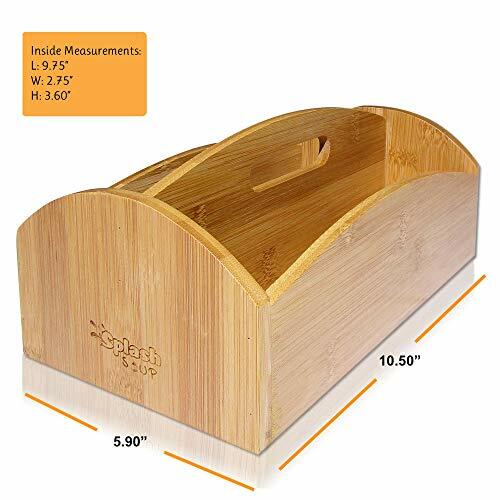 100% all natural bamboo easy-to-carry kitchen spice caddy. This convenient tote caddy works for the grill in carrying your spices, rubs, matches outside. It's a tough caddy made to withstand anything a spice rack could go through when going from the kitchen to the grill to the table...and back again. You can store small box items, rubs, herbs in the dual-divided item. 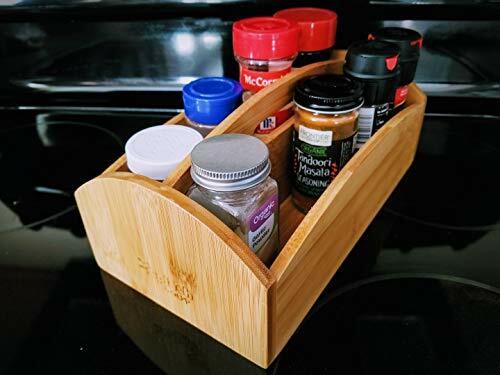 This spice rack caddy is made from sustainable forests. 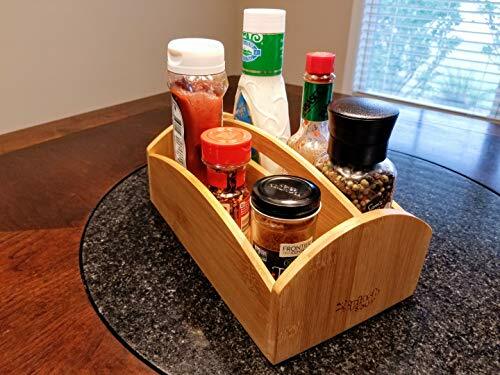 You're getting the best of all worlds; natural, eco-friendly, woodsy looking and NO TREES were harmed in the making of this convenient carry-along spice tote tray. 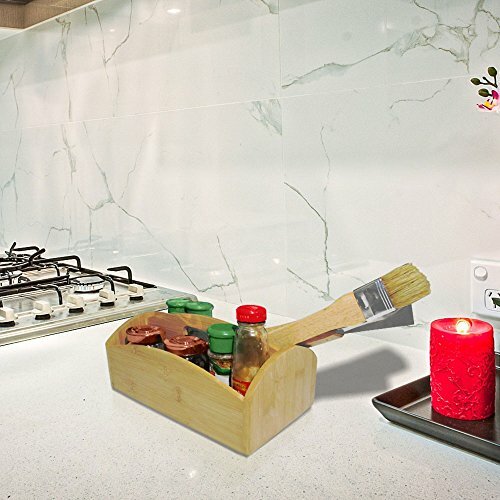 Allows for a more rustic and natural look in your kitchen than plastic. Rustic and rugged for an item that you can carry to the grill. When the cooking is finished, the item is classy enough to set right in the middle of the dining or picnic table to hold the salts, peppers, hot sauce, whatever your flavor. When not in use, this item conveniently fits in cabinets or the pantry. But let's be realistic; it's a good looking enough, rustic manufactured container, that you'd be proud to leave out on any kitchen countertop or dining table. Observe the measurements and depth. 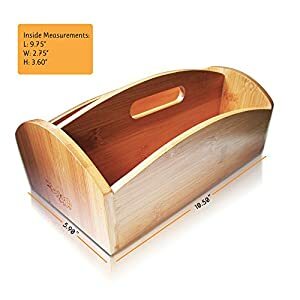 This item is very versatile and can be used to tote home supplies, art accessories, touch-up kits, sewing tools, any kind of house equipment. Children love it for crayons and markers. When organizing with SplashSoup, you're saving forests. CUSTOMER SERVICE: This is a SplashSoup manufactured and branded item and we offer top notch customer service and meticulously crafted and offered reasonable homeware. Our customer service is quick on the draw. Keep organized, keep environmentally friendly and enjoy SplashSoup. DIVIDED STORAGE CADDY 2 compartments divided by easy-to-carry tote handle. Quick organization for spices, herbs and cooking ingredients. Convenient carry for pantry items, cooking packets, boxed puddings, small baking supplies and even accessories. From the kitchen to the grill and to the dining table, this is the perfect chef companion. This is no mamby pamby spice tote but is built for durability. 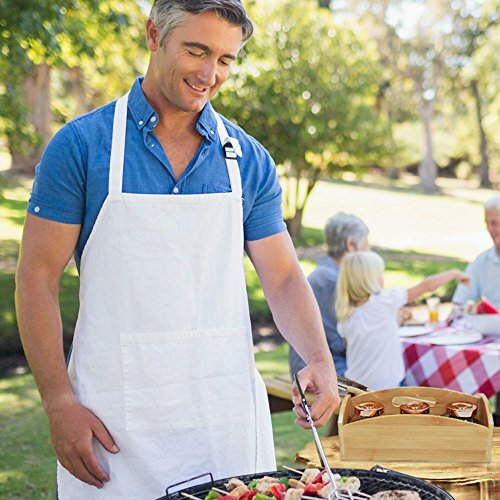 Taking it to the grill or picnic table? No problem. It can take dents, scratches...anything! EASY TOTE | CONVENIENT FIT | SPACE SAVER: From the pantry to the grill or the cupboard to the stove. Carry this natural piece anywhere in the kitchen to the outdoors. From toting your grill spices, tools and accessories or properly storing spices and herbs in the pantry. Easy reach with the convenient handle. Easily fits in cabinets and a fantastic space saver. MULTIFUNCTIONAL: This convenient caddy works for the kitchen, carrying outdoors to the grill, gardening helper or anywhere when portability requires bringing your spices or tools back and forth. This spice caddy is a durable item, so you DON'T have to handle with kid gloves. It can get rough and tumble if necessary. That's because it's all natural 100% bamboo with NO MDF or any kind of product substitute. ENVIRONMENTAL AND NATURAL 100% all natural bamboo. No forests were wasted for our convenience in the making of this natural product. No eyesore plastic but a nice rustic piece. Easy to clean by wiping with damp cloth. Many items claiming to be all bamboo still have the MDF base. Not this item. it's bamboo through and through. DIMENSIONS: 10.5 x 5.8 x 4.8 inches. Easy to fit in cabinets, pantry and closets but even better DISPLAYED and letting everyone see this item!